Well after the last year combination of the V-2 rocket with Meillerwagen and Hanomag SS-100 Strassenschlepper, they have as this years surprise the Vidal street-transporter. It is already posible to pre order the kit on some webshops. 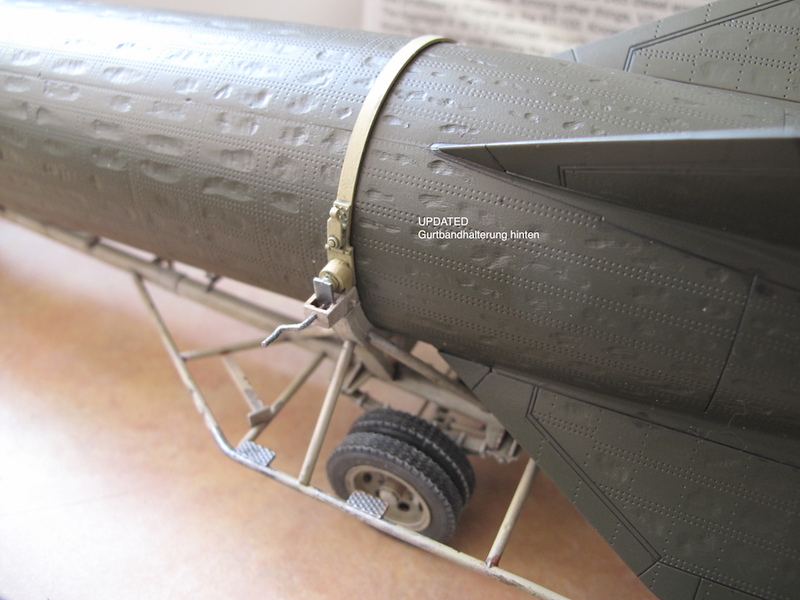 This is a must have for the V-2 modeller, this model is a easy model and not like the Meiller a scratching project for many weeks ( mounts). The first view of 3D drawings is promising . The TAKOM set with V-2 VIDALWAGEN and Hanomag is comming out to the shops. 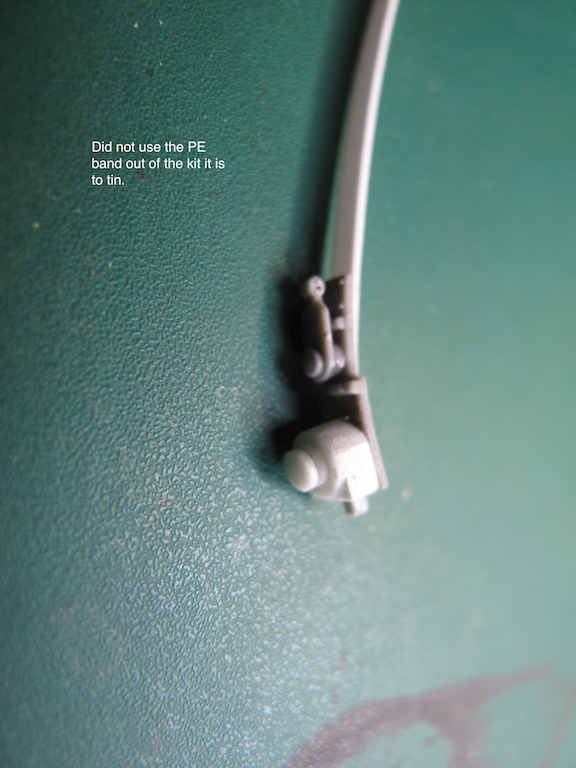 If intrested take a look at the site of Luckymodel they have the Sprue, PE and Decals already on there site. The Vidalwagen road-transporter of the first ballistic rocket in the world, yes we are talking about the A-4’s Vidalwagen the Fz-Pos-No 601 mod 1. These trailers were in use for the transportation of the Rocket from the railway-point to the store at the technical battery and after that to a position close to the launch site of the A-4 to be transferred to the Meillerwagen with the use of the Strabo crane. The were also transferred from the train wagon to the Vidalwagen by the use of the Strabo crane. 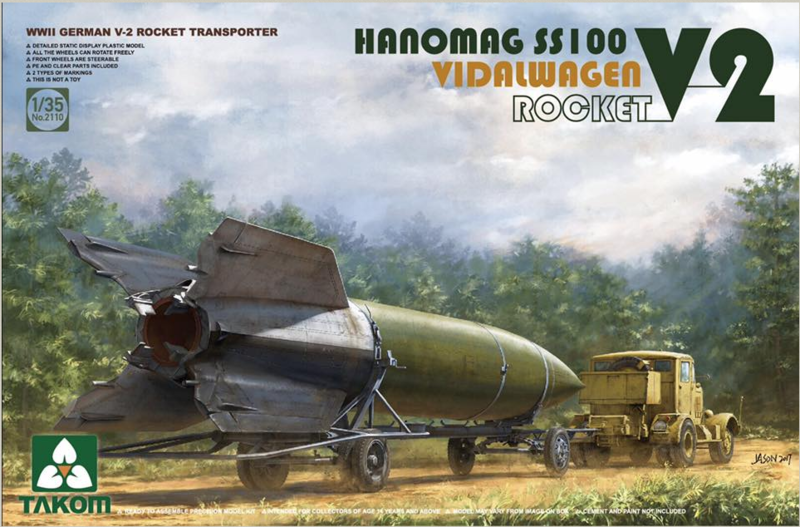 After the Meillerwagen/A4 set of last year Takom did surprise us with the news that they also would bring us the Vidalwagen in a set with a A-4 Rocket and Hanomag SS-100 Strassenschlepper. 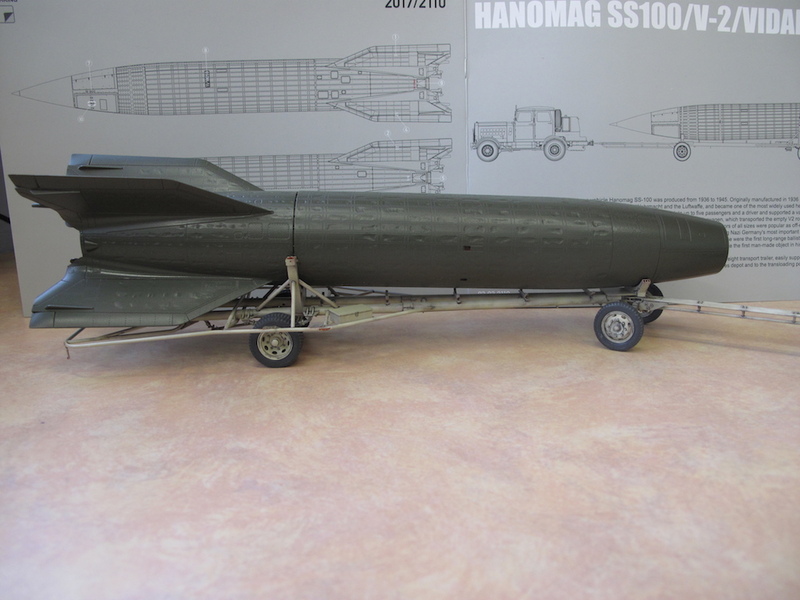 I have silent wishes for more A-4/V-2 related models in this 1/35 scale. 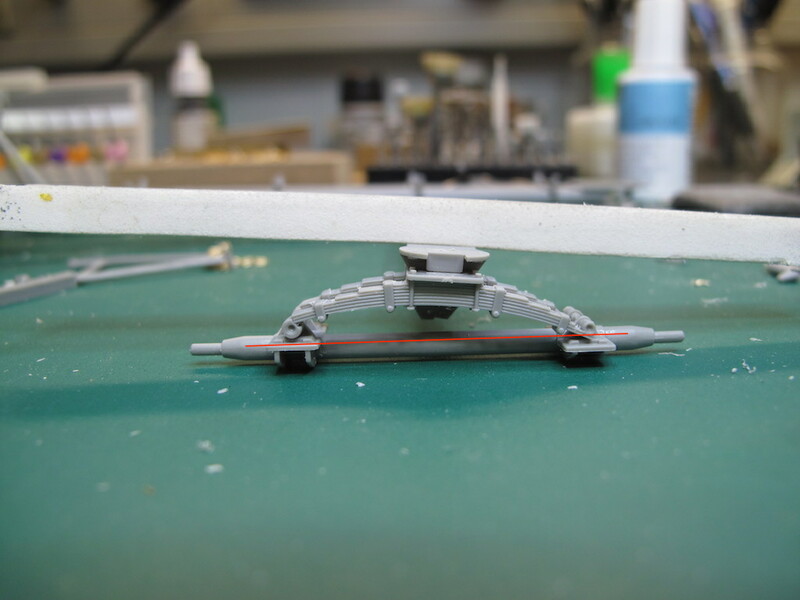 On my wish-list are the Pumpentrailer, A-stoff trailer, T-stoffheater or a Fries strabocrane also high on the wish-list of many panzermodelbuilders. 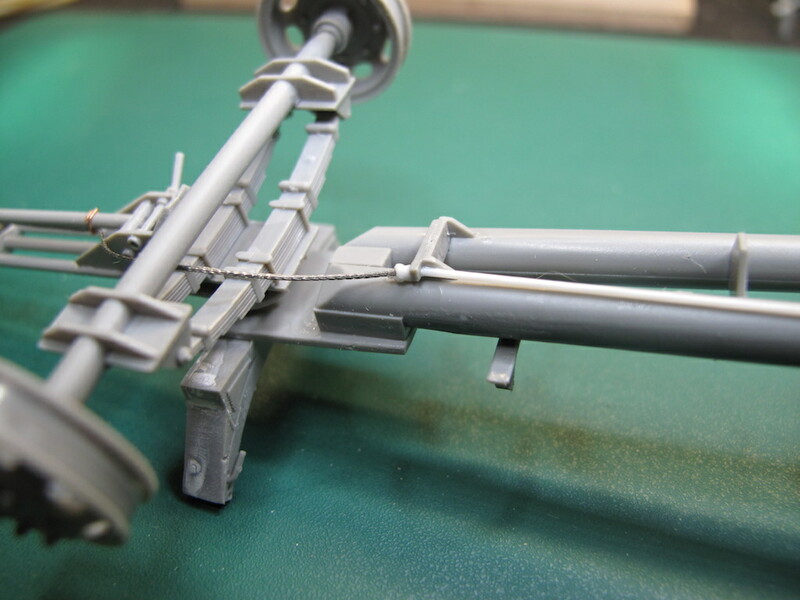 There are already some talk around of a Feurleitwagen based on the Sd Kfz 7 from a other eastern modelbox maker. Today the postman did bring me two of these sets (TAKOM 2110) . 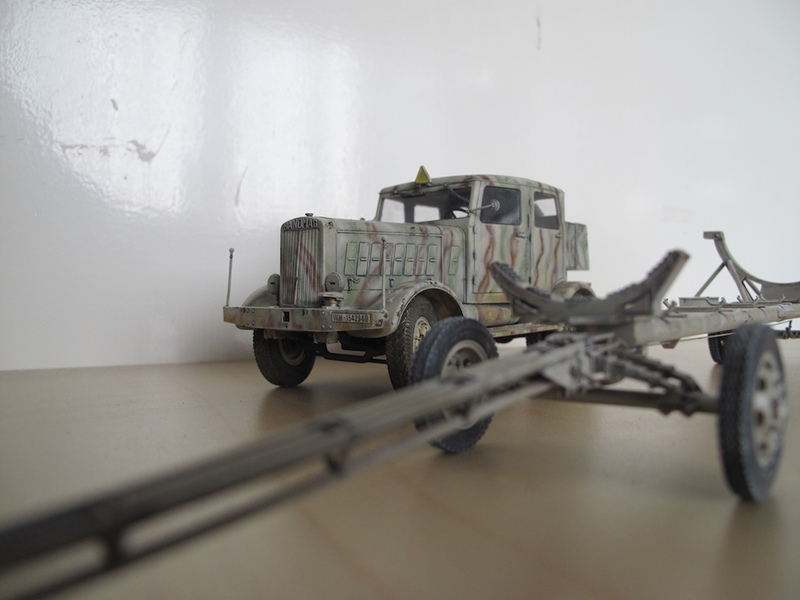 In this build I will just make a review of the Vidal and not of the Hanomag or the A-4 rocket it self. Again it is a big box filled with sprue all in separate bags, and one bag with the booklet of the Vidal and the A-4, the Hanomag, decals and the PE set for the rocket and the Hanomag. 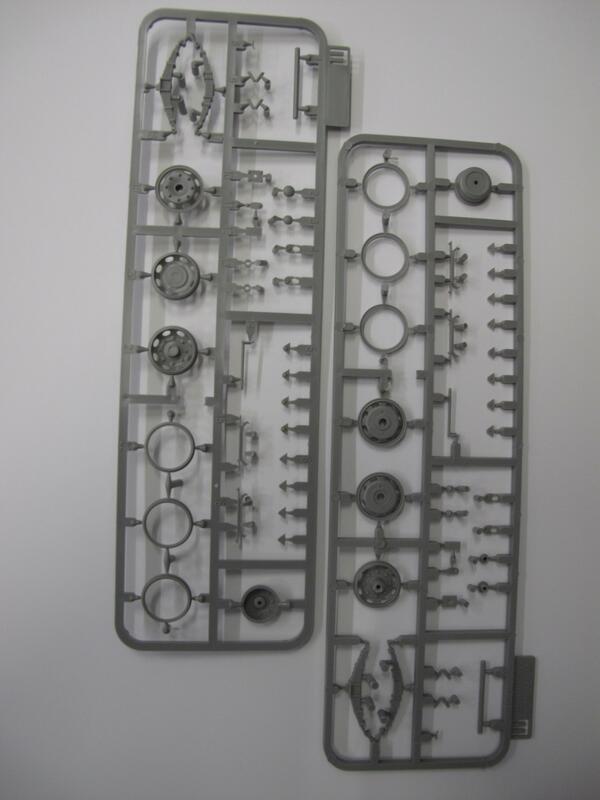 The first look at the Vidal sprue there are one large and two smaller sprue in the bag, the large containing the large parts of the trailer, and the smaller the parts that you need twice, like wheel rims, springs and so. There is also a small bag with the rubber tyres. The booklet is again a nice piece of printing on a good type of paper. 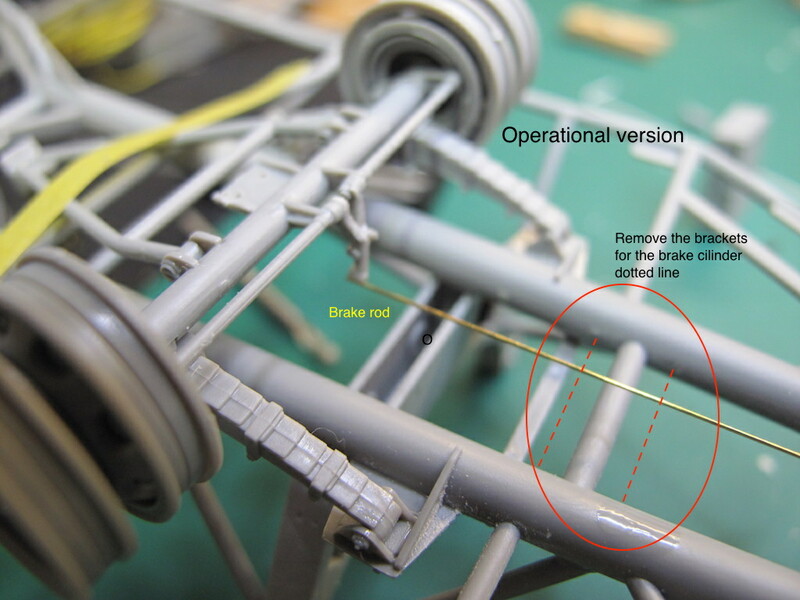 Page 2 gives a very good and clear view of the sprue of the rocket and the Vidalwagen, showing professionals do this. Page 3 to 7 gives a clear view how to ensemble the Vidalwagen, pages 8 to 9the building of the rocket it self. 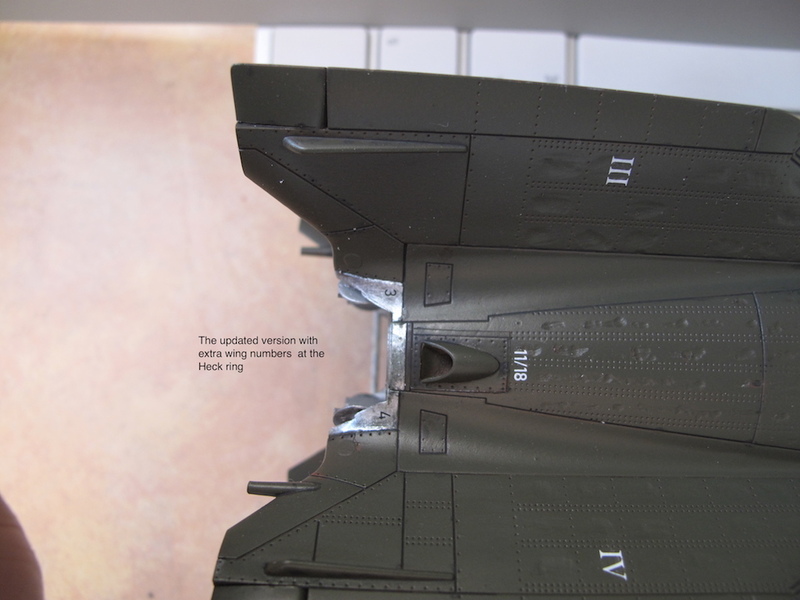 Page 10 is a overview drawing of the assembled models, and page 11 gives two paint examples made by AMMO-Mig. Personally I find the paint examples not that good as I had hoped, just a difference in the colouring of the Hanomag and not of the rocket. 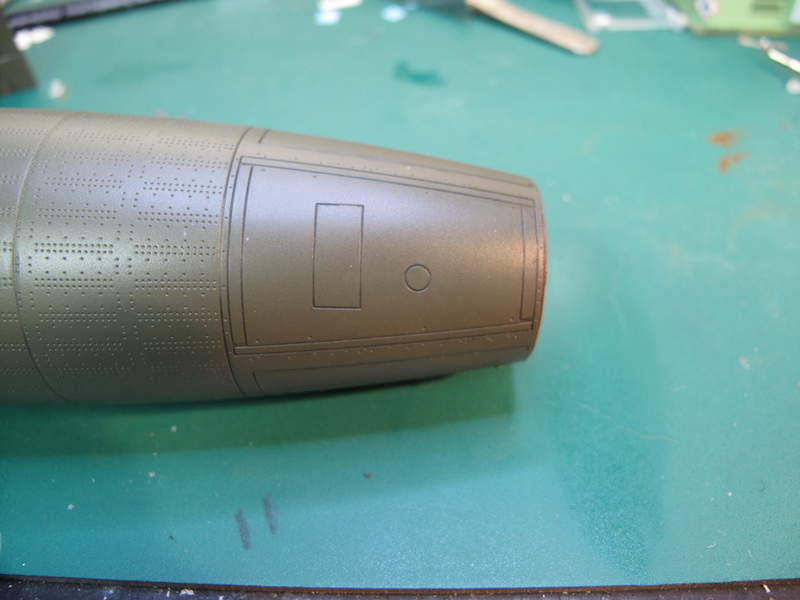 The first look at the Vidal sprue is gives me a good feeling looking nice and crisp with not very little flash. And yes it is like the Meillerwagen a 1to1 copy of the Cosford Vidalwagen, so to say it is a real museum piece. The Cosford Vidalwagen is the only survivor in the world, there were some in the US and one in Australia but we don’t now were the are or even do the still exist . So to build this model the only reference will be the Vidal at Cosford, and some documentation that exist of the Vidal at the AWM. 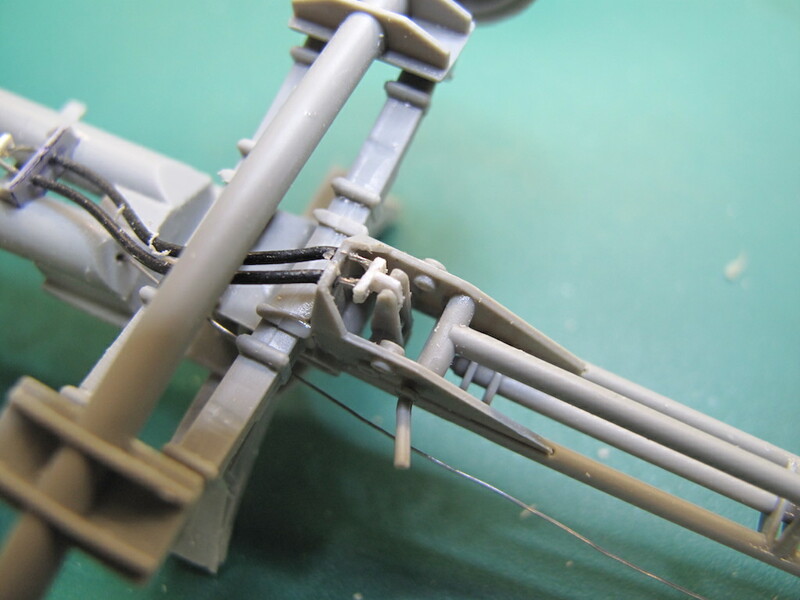 A first inspection of the sprue and drawing shows me that there are some small things missing. 1e no spare wheel in the kit. The German break system was mechanical, but there were plans to change this in to a pneumatic system. 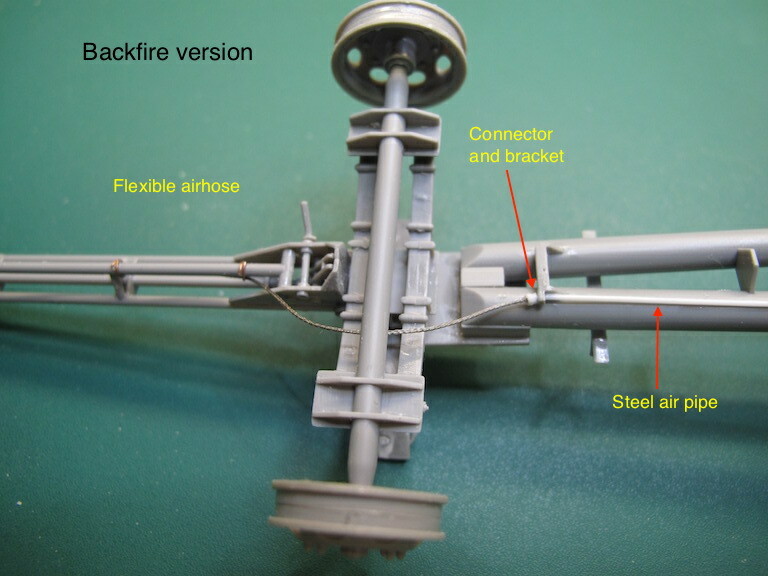 The brake-system that is installed on the TAKOM Vidal is must be British and made at Coxhaven during Operation Backfire. 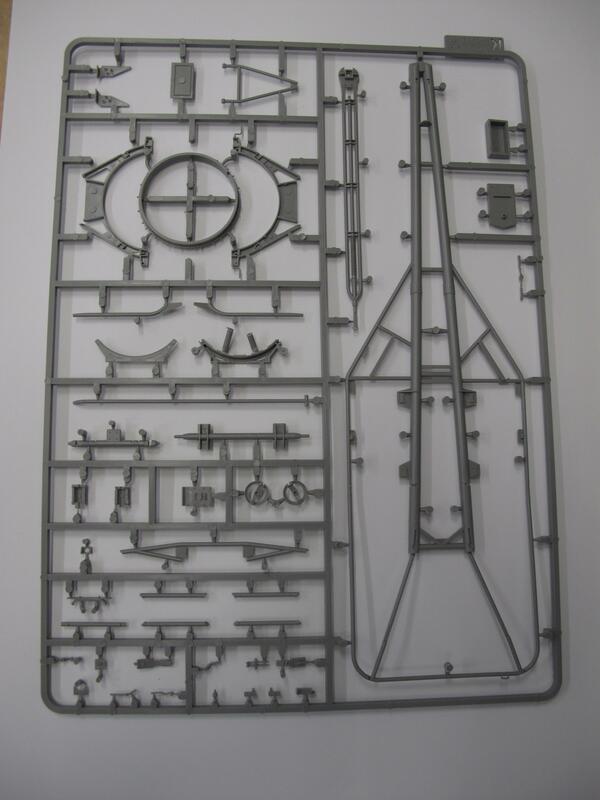 Ok let me show you the sprue of the Vidalwagen as first the main sprue with the larger parts. This will the build for the Christmas days. Will keep you posted on this small trailer build. Ps a little warning for those of you planning to make a compleet battery, there were 27 Vidalwagens in one rocket battery..
nichts für ungut. Aber der Ort der OP Backfire ist "Cuxhaven". Mein Heimatort. Vidalwagen liegt bei mir auch schon vor. Sorry looking back I see that I use both names. Did change the Cockshaven in to Cuxhaven. The first plan was to build one Vidal out of the Box, and the second as a original war time operational rocket transporter. Made a small change in the planning will update the out of the box with the missing parts in the (Backfire) brake system. 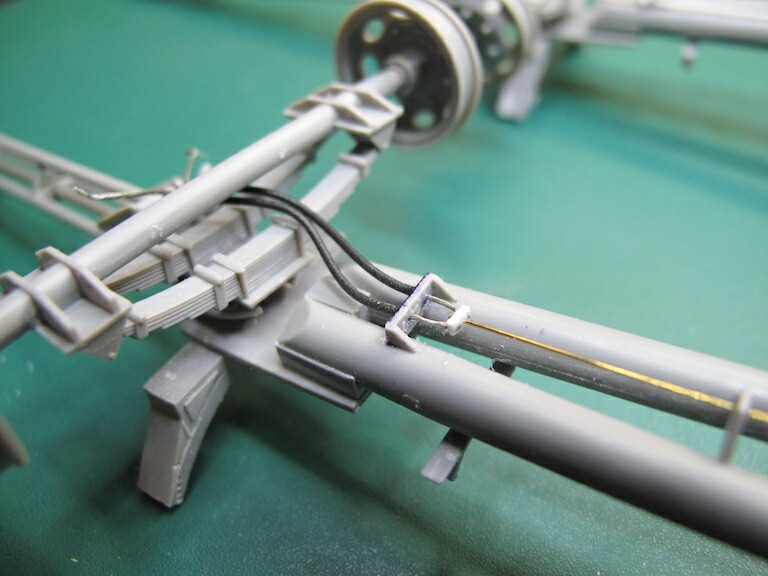 On the Cosford Vidal the brake system is almost complete Takom did not copy these parts in to the model. The Vidal, out of the box. Specially when making the part with the towing bar and the front axle. The construction of the springs is critical, when you turn them 180 degree you get the situation as in the next picture. When you want to make the operational version of the Vidal you do not use parts K22 and K23, also the brackets for this pneumatic cylinder have to be removed from the main frame. 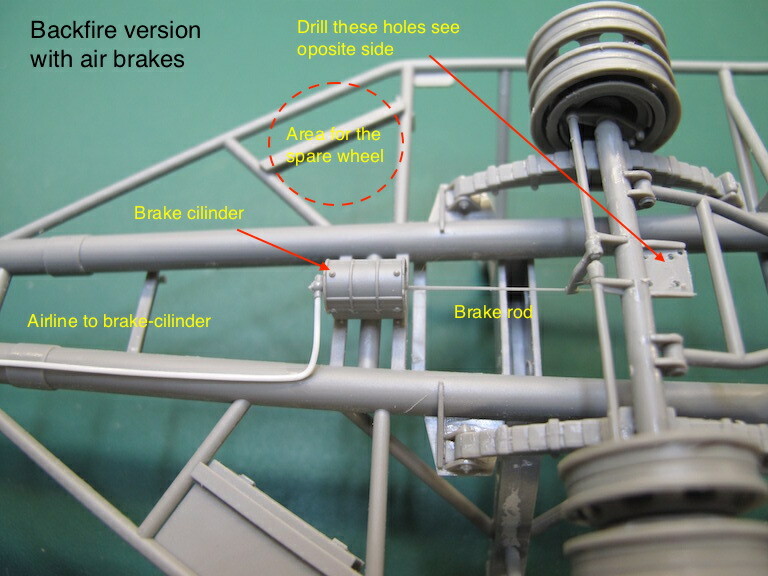 Step number 6 is the making of the reversing brake and the rear axle, the drawing is not showing how this brake was held from the road when not in use. 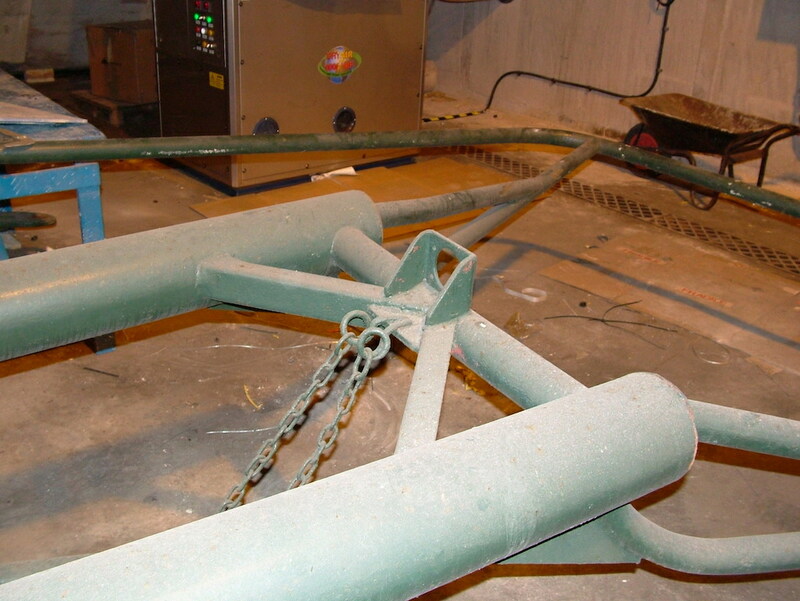 There wer two hooks welded on the main frame as can be seen on the picture. 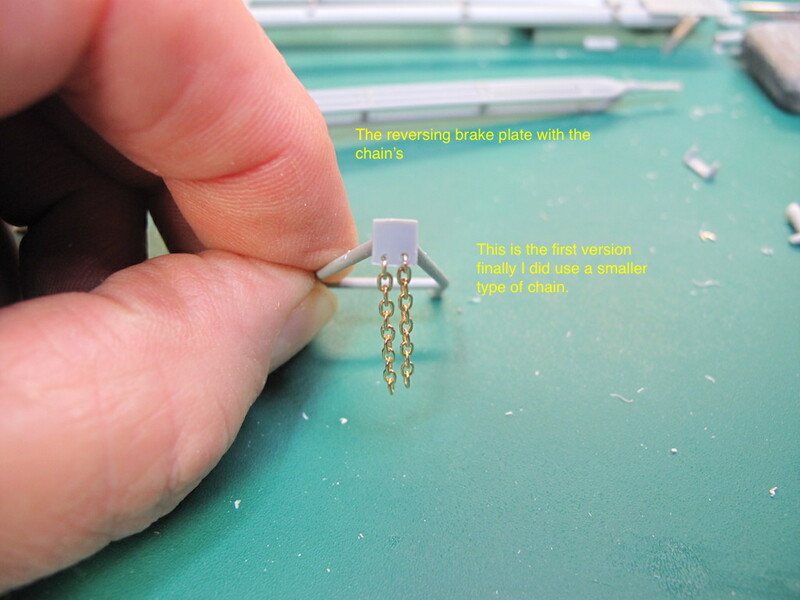 And on the reverse brake-plate the model shows two holes, were two small pieces of chain were mounted, in traveling position these small chains were connected in the hooks on the frame. The following picture of the Cosford Vidal will show you how, use for this the smallest chain you can get your hands on. 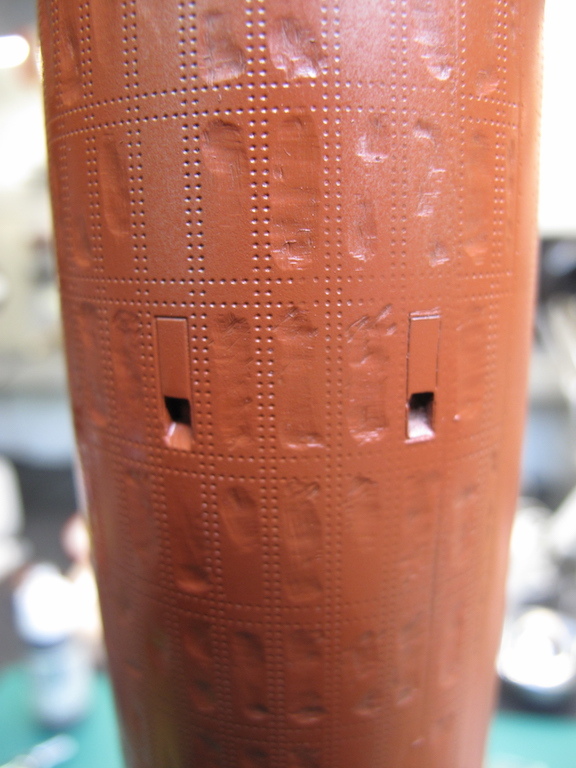 On part K21 (rear axle) there is a plate with 5 small holes, drill these out with a 0,5 mm drill. 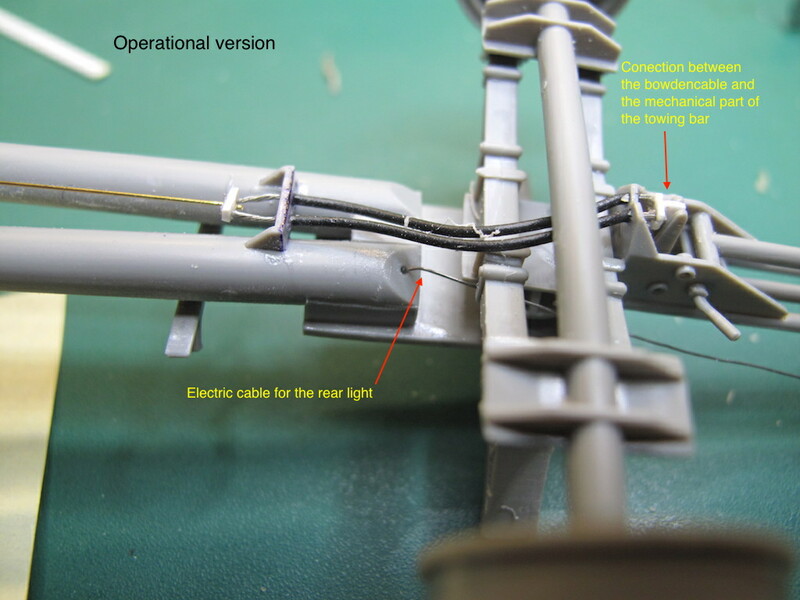 And for the other changes, may the pictures speak to show you what there has to be done to complete this very fine model. 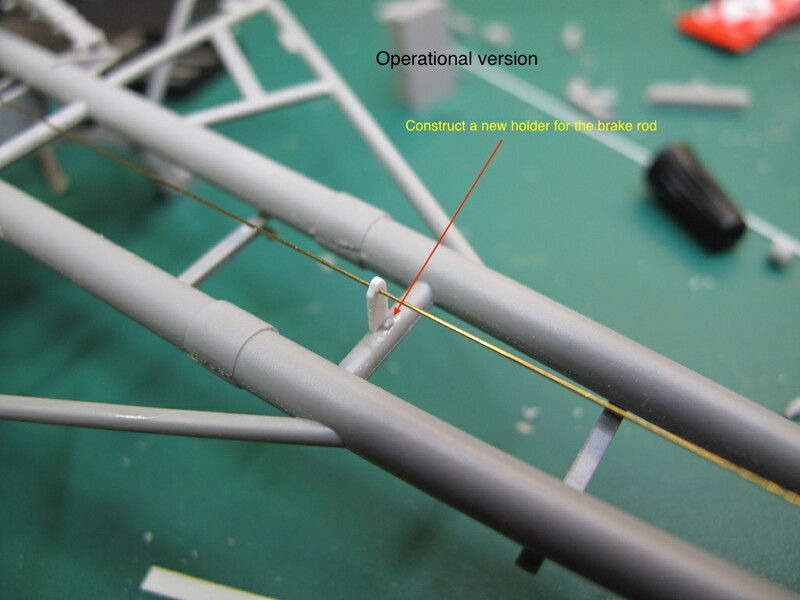 This week the last picture of th building of the Operational version will be made had some problems when mounting the bowden cable to the system of the trailer front axle. Comments, critics and questions are welcome. The Operational Vidal got the coupling in the brake system installed and is now ready for the painting. 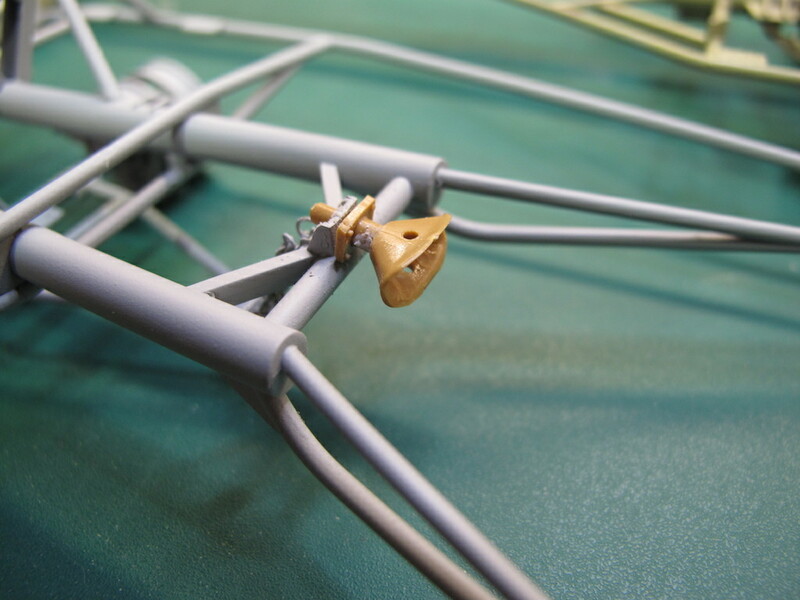 On both trailers there are just small details to do when the rocket is placed on the Vidal, thats for latter. 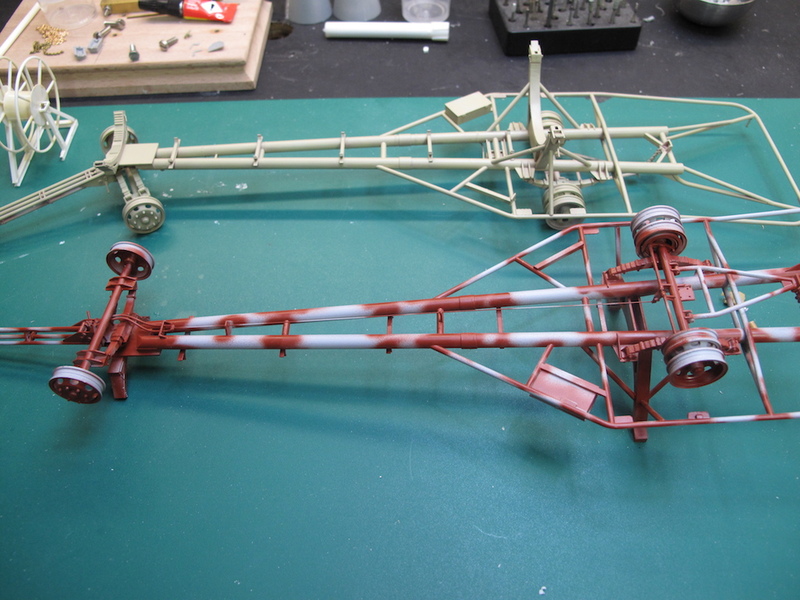 And I also started the paint job on the trailers starting with a primer. 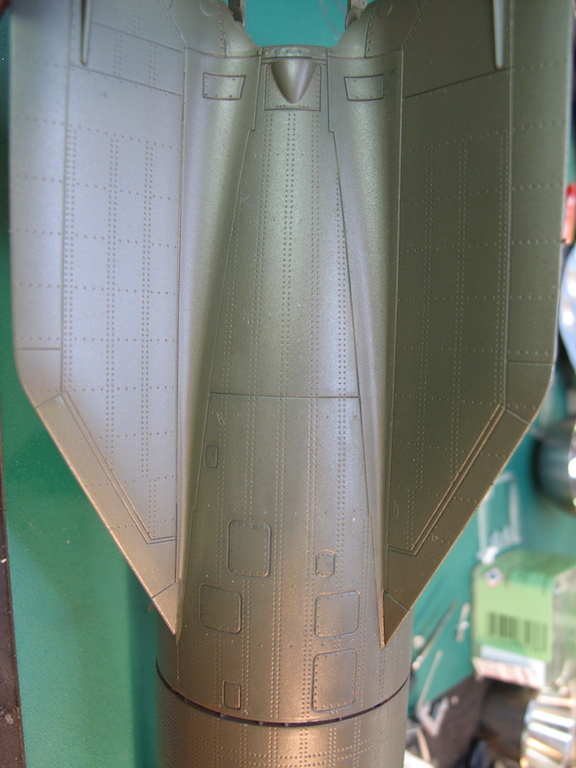 The Backfire version got his first light grey primer and also spots of RAL 8012 Rotbraun, the Operational version just his layer of primer. For the Primer I have used the Vallejo 74.601, the Rotbraun is from AMMO. Man weiß mittlerweile gar nicht mehr, welche Worte des Staunens man noch schreiben soll. Einfach nur herrlich, super, genial ! Bert, uns gehen die Superlative aus. 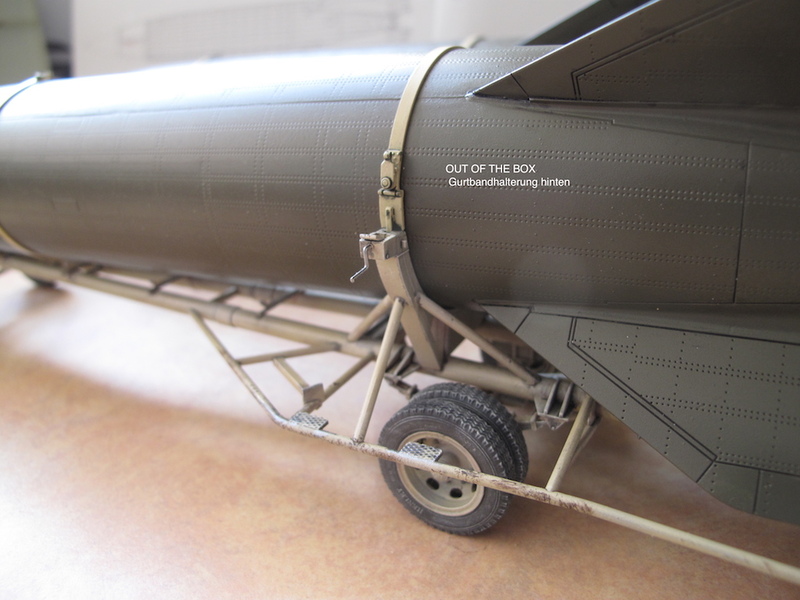 This new box of TAKOM has next to the main model also a A-4 V-2 rocket and a Hanomag SS-100 in the box. The Hanomag is already described in the review of the Meillerwagen so no need to do it here again. The rocket is also there but I want to show some details also in this review. 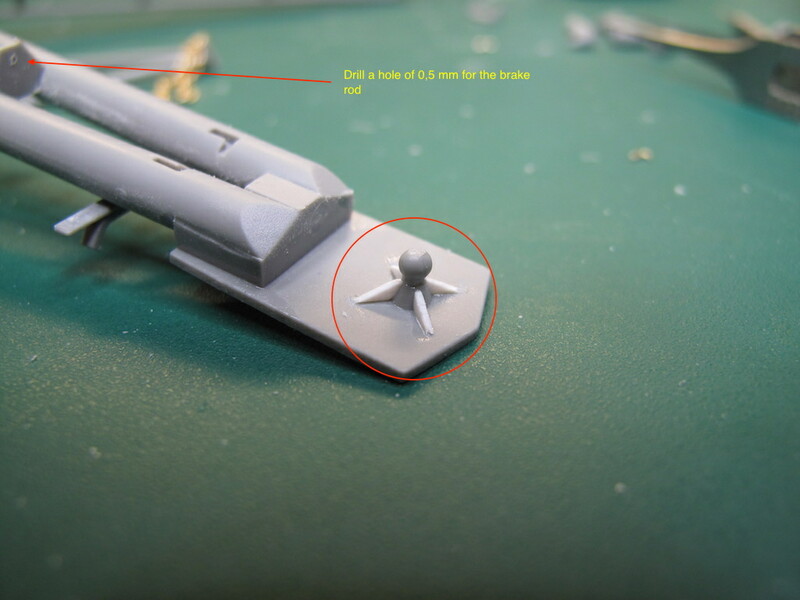 Well it looks that TAKOM also did read the review of the Meillerwagen because they hade made a update to there rocket, in the Meiller review I did describe how I made the rockets parts fit in a better way, well they did modify the fit of the rocket. In the Meiller review I did mention the ventilation hatches in the hull between the A and B-stoff tank but for got to show there location. Time to show there location do that with a FIBEl page , no not the Tiger fibel but the A-4 fibel. 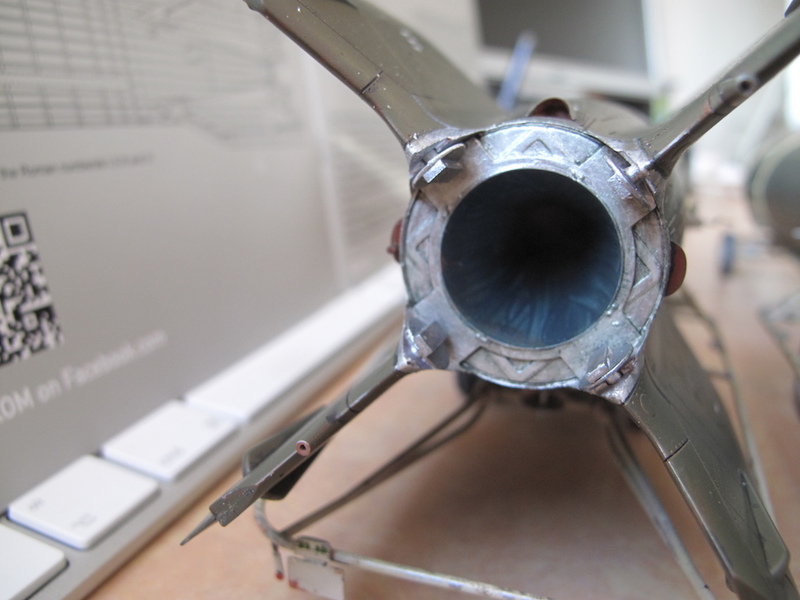 On our rocket Takom made four hatches on the rocket body but just two have a ventilation opening. The number 10 hatches are closed and only used for unloading the B-stoff when the rocket did fail to launch. 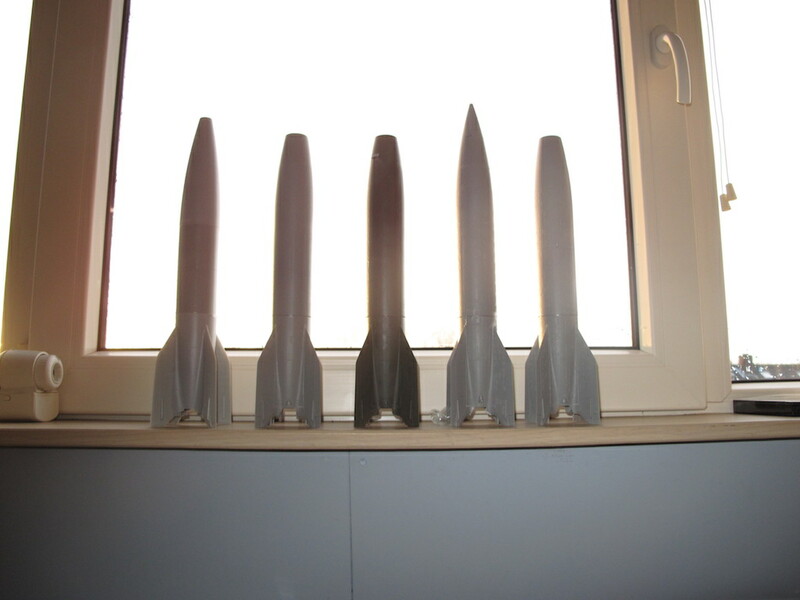 Rockets in progress the left is a Dragon/Revell A-4 the otheres are from TAKOM. New item on the Vidal is a trailer coupling, all Vidalwagens had this to couple several trailers in to a road train. Have seen pictures of the Abberdeen Meiller were on some parts the red lead was still visiable, I will try that effect also on the Vidalwagen. Wieder eine klasse Arbeit von dir, Bert - sauber gebaut und recherchiert. Spend a lot of time on the A-4 body to create the look of a stressed skin, see also my Meillerwagen review. 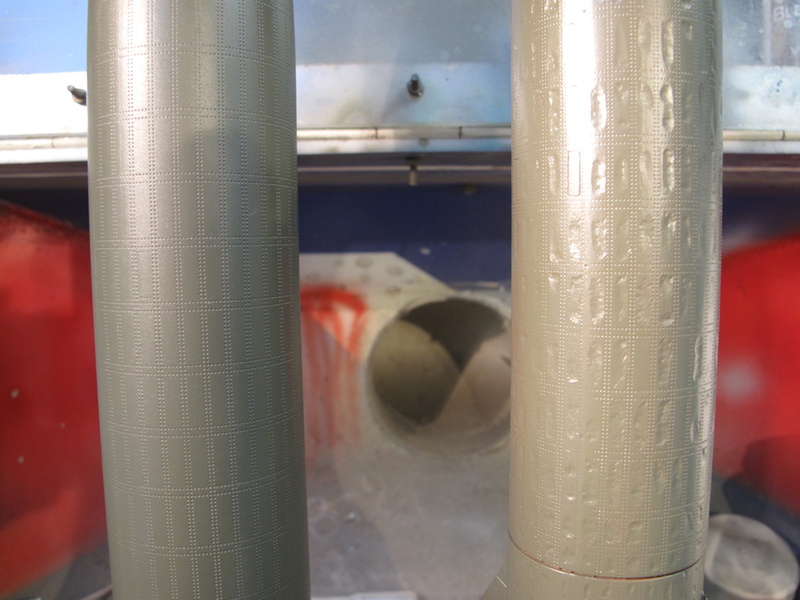 After that the rocket became a first layer of menig (A Mig-014) , and after that the olive grun (A Mig 001) and the last in tin layers in that way you get the impression of some red colour coming trough the grun. 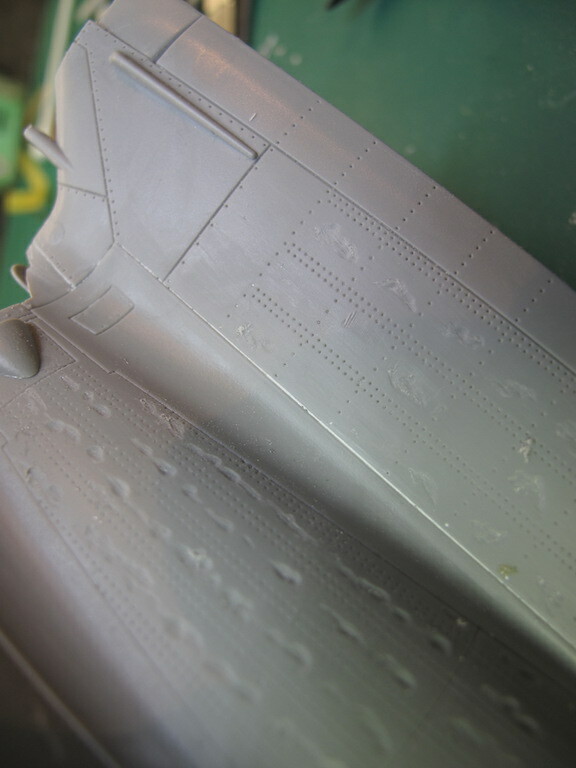 After the painting of the rocket I did some line-wash on the instrument compartment and on the tail section. 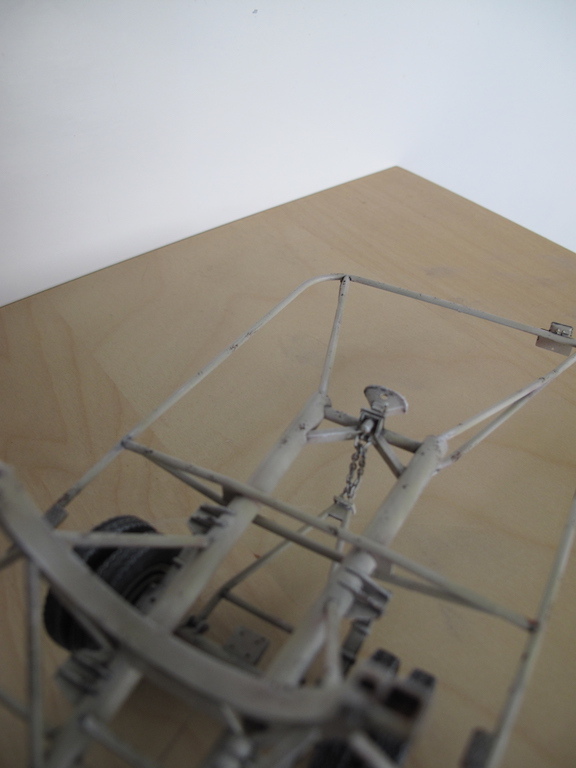 And again there is a Hanomag to build in this Takom set I will not describe this here but see my Meillerwagen review. 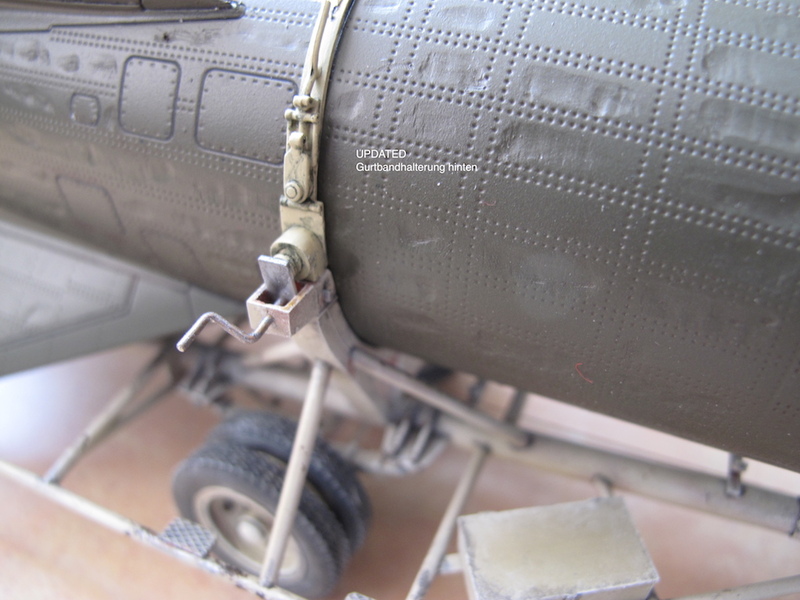 The only difference is that I did use resin tyres on this model from Panzerart and these are looking good, the only thing that is disturbing me on these tyres is that they did not have a spare tyre with in this set. http://panzerart.pl/index.php/welcome/produkt/472 Continental tyres or Fulda tyres. A other new product for this Hanomag is a PE set from Voyager. This presents the late war version engine hood, personaly I like the original version more. 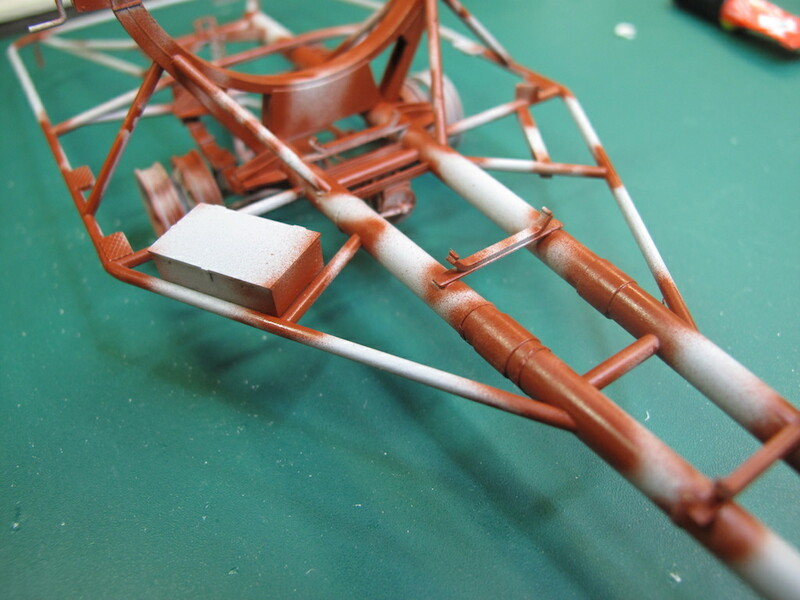 The Vidalwagen is painted with RAL 7028Dunkelgelb aus ’44 DG I (A Mig011) and then a very tin layer of the RAL 7028 Dunkelgelb “44 DG III , the last in a cloudy way to give the impression of a used vehicle. Then a airbrushed with a clear glossy varnish to close the paint, then some washes and chipping. 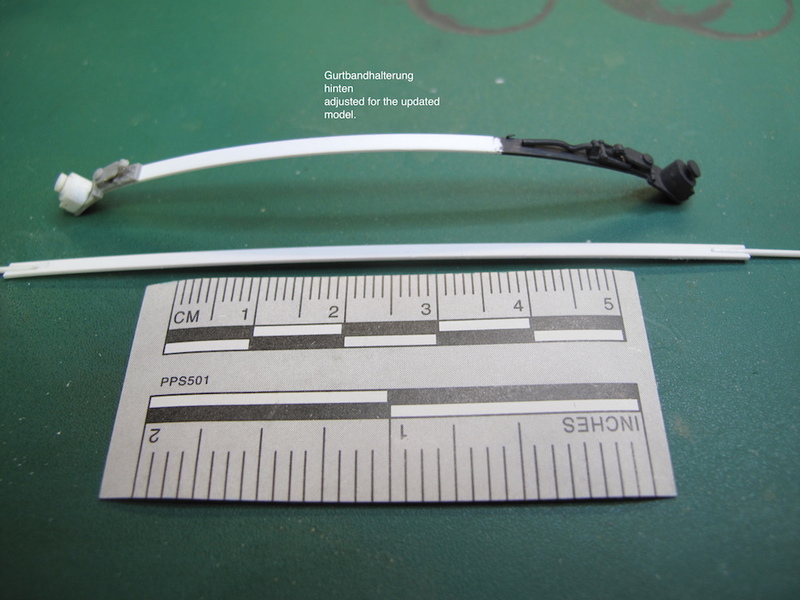 The last thing that I have to do now is the hoisting bands, and I just find out that this will give me a problem, because the kit is not complete have to do some research how to correct this on my model. 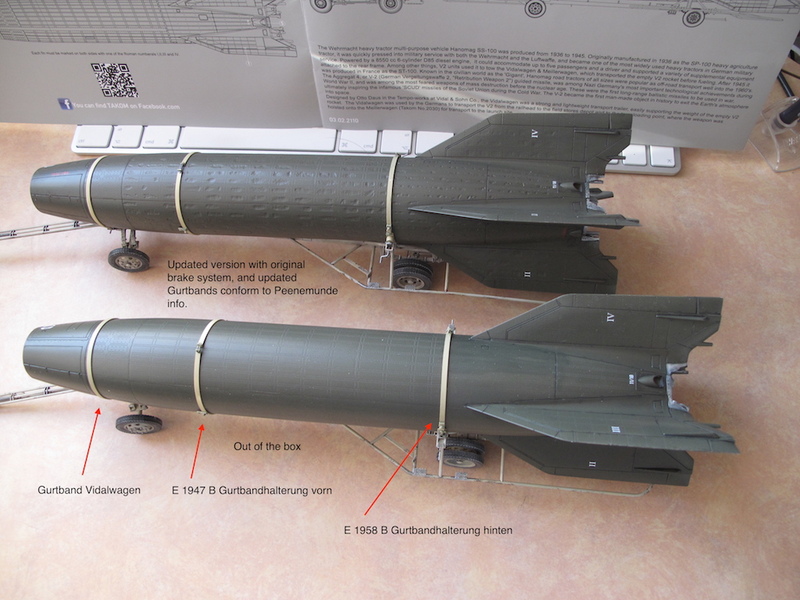 What also is a point of research are the decals of the Meillerwagen and the Vidalwagen rockets, they are not correct and not complete. So you see, if one thing is solved the next is comming up, but that’s the joy of modelling. Genial, Bert. Bin gespannt, bringst Du das mit nach Mol? Will take the Vidaltrailers at first to the Dutch Twenot Meting on the 4th of March at the Overloon War Museum but also to Mol. The Meillerwagen will not finished at Overloon, but will be at the Mol convention, later this year. That must be a visual effect the front axle is on its place. But I have the experiance from my first Hanomag that both axle are not right in hight. There for I did place them in a higher positon giving the tyres more space in the mudguard, this is done based on the pictures I have of the Hanomag. So this will be the final part of the building review of the Takom Vidalwagens , and it did take some time to get this build to the end. As I already did mention every time that I was sure about a piece of a update there came a other piece of information, and that takes time, but I feel now that the models are ready. Like a air-hose for the British pneumatic brake, better Gurdbands (official German name), and removed Graphite rudders. Both rockets have no warhead as being on transfer route from the train station to the technical battery. In this transport mode the Gerateraum is closed at the front with a metal plate. 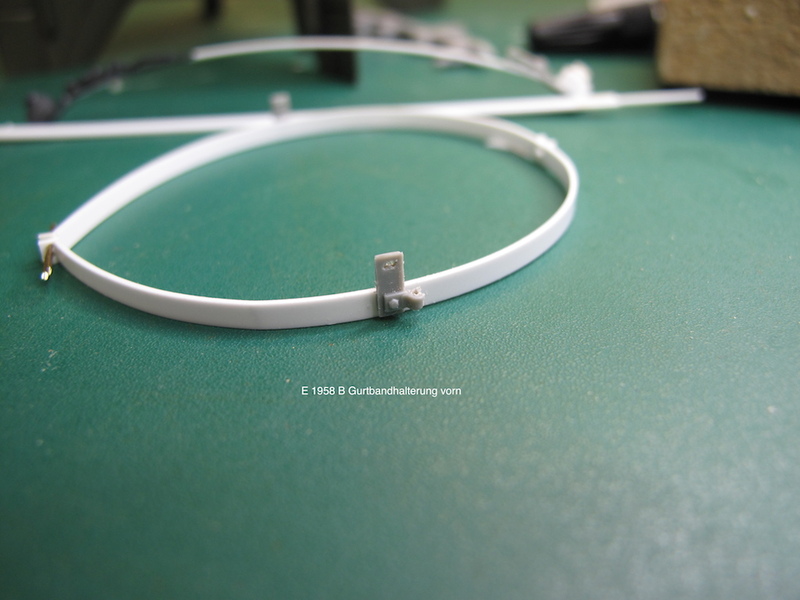 The Gurdbands from Takom are to tin the original is a steel-band covered on the inside with a layer of felt, this is the reason for me to create new Gurtbands. 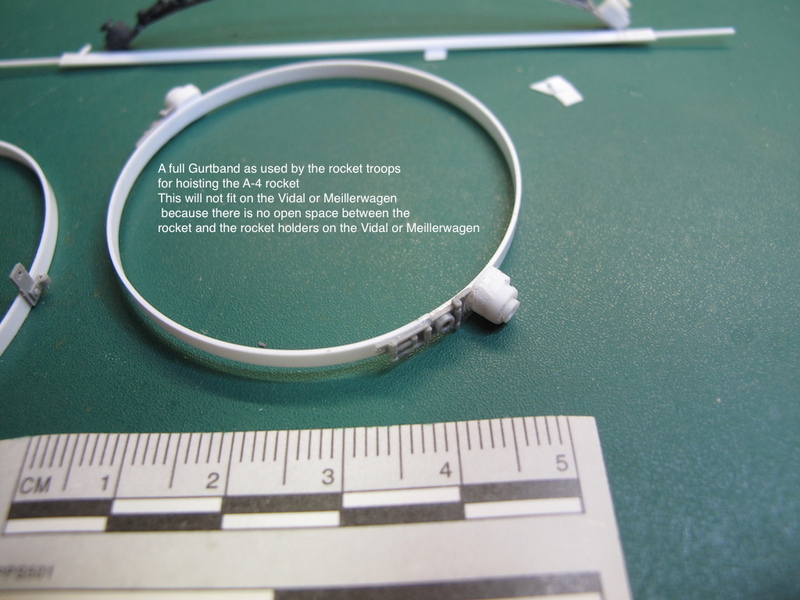 The next pictures show the Gurtbands on the Vidal and rocket you also can see the difference of the Out of the Box and the updated version. 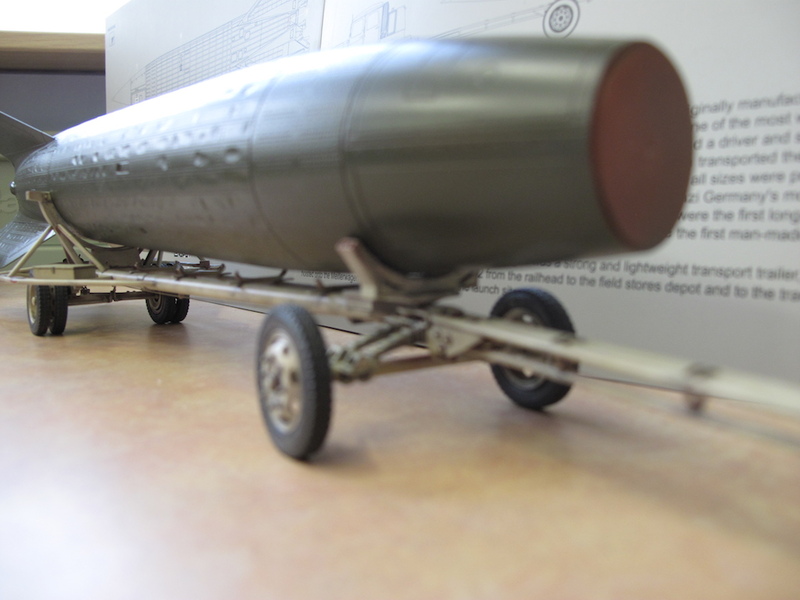 And at last overview picture of both sets Vidalwagen with a loaded A-4 rocket. 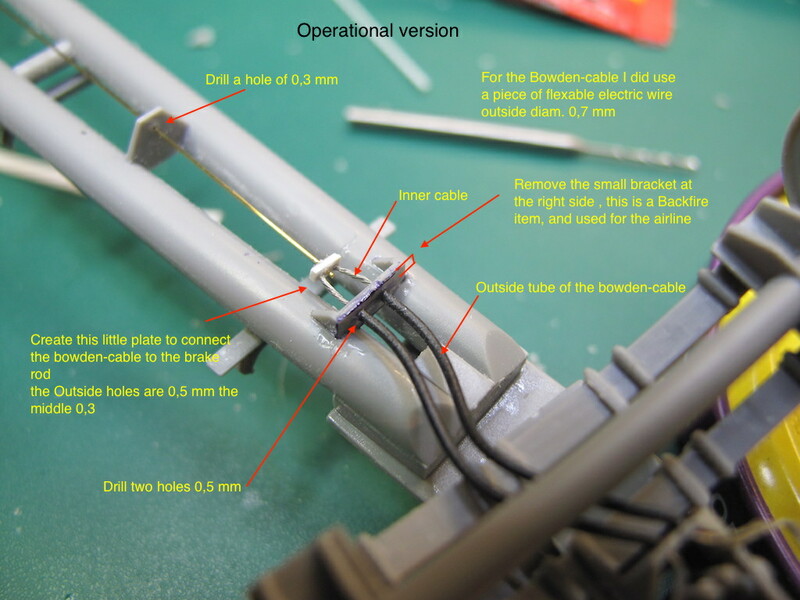 Well this ends the Vidalwagen building review, I will post some new total overview pictures in the ready models section. I hope you have enjoyed this review as much as I did by building and writing about this model. 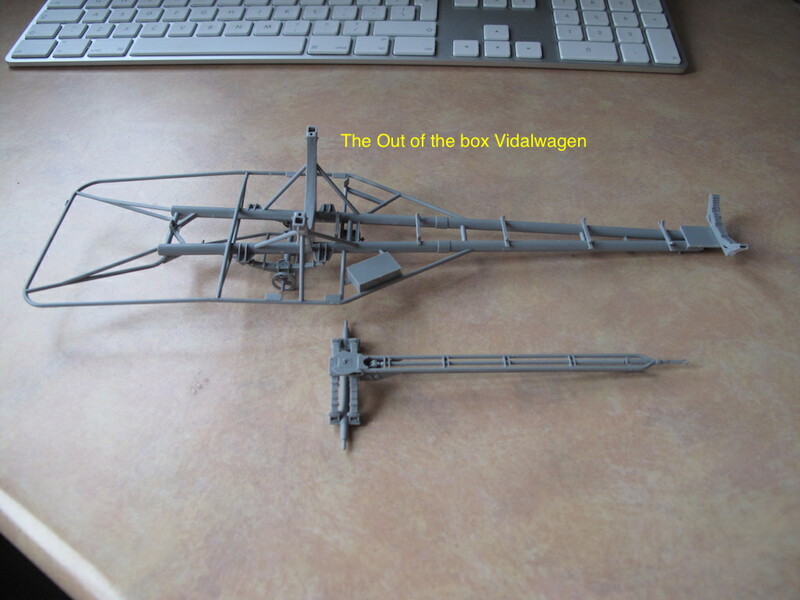 If there are questions about this model or the original trailer let me now, maybe I can help or clear some of the technical aspects of the Vidalwagen. 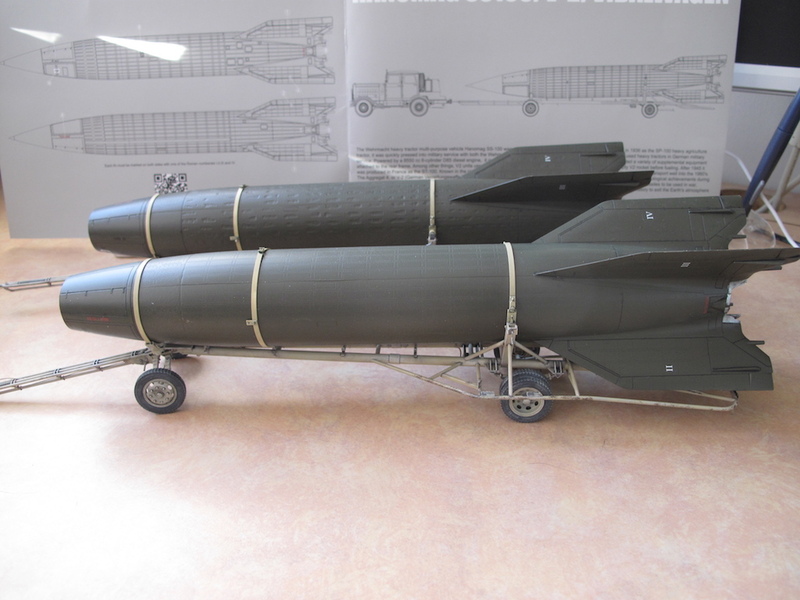 DEAR V-2 MODELBUILDERS THERE IS A MISTAKE IN THE DRAWING OF THE V-2 MODEL !! 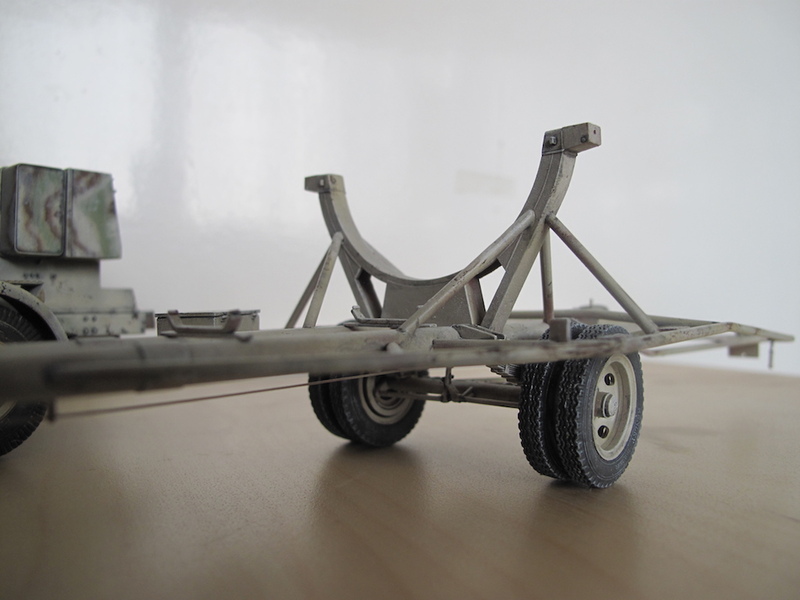 SEE A DISCRIPTION ON THE PAGE OF MY MEILLERWAGEN BUILD ON THIS FORUM.